Here's a little-known fact: Six Flags Great Escape and Hurricane Harbor is not located in Lake George, as many assume, but is actually situated in Queensbury! 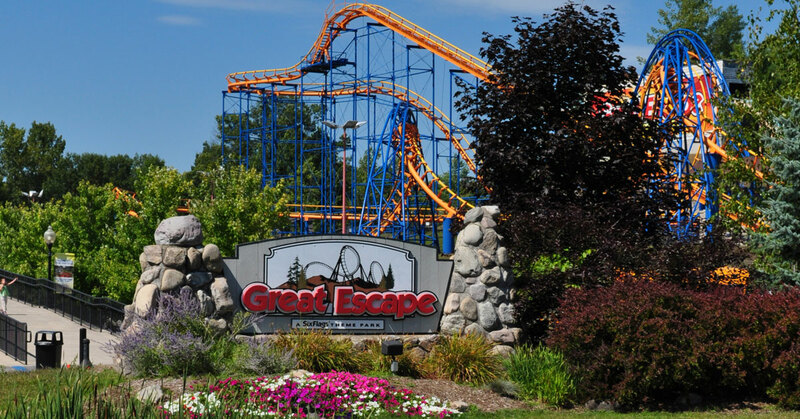 The Great Escape, as locals call it, is a dynamic park with rides for all ages and temperaments, along with entertainment, food and other fun. As the weather warms, you might want to check out the water park - admission is included in your theme park ticket, so you can swim until you're pruney and then hop on a coaster to dry off. While in the park, thrill-seekers will want to check out the many intense rides, like Extreme Supernova, Flashback, and Greezed Lightnin'. A Sasquatch can be found in the front of the park, too. No, not the hairy mythical monster, but a ride with a near-200 ft. drop! Believe it or not, The Great Escape wasn't always a big thriller. When it opened in 1954, it was "Storytown USA," Charles R. Wood's Mother Goose-themed park for young children. As the park grew, so did its appeal. Today there are shows, rides, and a whole section of the park dedicated to kids and families! Throughout the park, you'll still find remnants of Storytown. Explore fairytale cottages and meet with Cinderella herself! The park hosts a number of special events each year, including the always popular Fright Fest come Halloween. Whenever you decide to go, and whoever you bring with you, there is something fun for everyone inside the Six Flags Great Escape Theme Park and Hurricane Harbor in Queensbury, NY!